Three men clad in army uniform forced Mutasa shop owners to reduce prices of selected goods - New Zimbabwe illustration. THREE men clad in army uniform on Wednesday went on a rampage, forcing Mutasa shop owners, "at knife point", to reduce prices of selected goods they went on to purchase, an MP from the area has reported. Trevor Saruwaka reported weekend that Farai Siduli, Rufaro Mashayanembwa and an unnamed driver of a Toyota Corolla, registration number ACD2000, descended on God's Will General Dealer run by Cleopas Sarupinda at Sarupinda Business Centre in Mutasa Central and demanded that certain goods have their prices lowered, at least for the short period they were in the shop. It is further said the suspected serving soldiers threatened the shopkeeper, one Eunice Tombo with a knife, chased away Alois Njopera, son to the shop owner after the latter had entered the shop in the middle of the incident. The soldiers, it is said, then collected some grocery items they wanted, which they paid for using their own prices, with $40.85 paid for commodities worth $72.50 and $22 from goods worth $37.70. "Mr Njopera suffered a total prejudice of $47.35 ($110.20 - $62.85)," Saruwaka said in a message he circulated through social media on Saturday. "They also did the same at Mambunde Store at Sarupinda, Masamvu store at DC, Chindondondo and Manatse store at Dzvinyu B/C. "These 'soldiers' are criminals who should be brought under control before they spread their criminal activities wider." Saruwaka told NewZimbabwe.com in a later interview that the incidents indeed happened in his area with police said to have been alerted of the acts. "This is true. It happened. The soldiers are yet to be arrested. The affected businessmen have made a police report and the police have promised to take action," he said. "We understand through local investigations that these soldiers are based in Nyanga. It is certain that they are soldiers. "We are still to get the name of the local guy who is believed to be from Dzvinyu. "It will be sad if action is not taken if soldiers put the law unto themselves. It is very dangerous." The incident comes amid a wave of price increases of goods and services by local businesses in the wake of Finance Minister Mthuli Ncube's recent policy pronouncements that have seen the Treasury boss introduce a 2 percent tax on all electronic transfers, coupled with a decision to downgrade bank balances previously in US dollar terms to the much dreaded Zim-dollars. Saruwaka said shop owners were justified in hiking prices of their goods to cushion themselves from a fast emerging financial disaster. "Prices were under control, but because of announcements made by the Finance Minister recently, our business people have responded to the development. It is not the case that they really wanted prices to go up," said the MDC legislator. "Why would they (soldiers) want to effect price controls on the goods they are only interested in? "This is wrong and it shows they want to gain personally and are not concerned about anyone else. "These soldiers are criminals who should be brought under control before they spread their criminal activities wider." The matter was reported at Mutasa Police Station, Criminal Investigation Department (CID) in Mutare and at the Zimbabwe National Army's 3 Brigade's Military Police. Efforts to get comment from Zimbabwe Defence Forces (ZDF) spokesperson Lieutenant Colonel Overson Mugwisi were not successful. 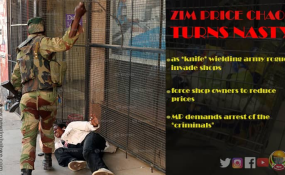 The swoop on shop owners by people linked to the country's dreaded military is a replica of the 2008 situation in which groups of junior soldiers invaded shops when prices of goods and services had gone far beyond the reach of the majority. Zimbabwean soldiers enjoy special treatment within the government workforce as they are often paid ahead of all civil servants but remain also vulnerable to economic difficulties as their wages are not too different from those of the rest.